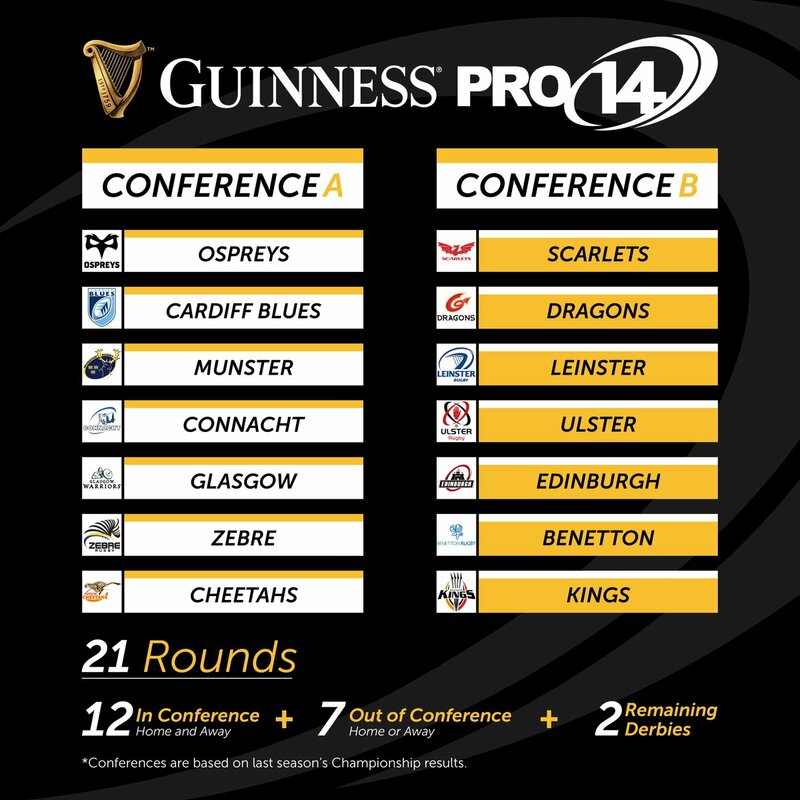 So the PRO 12 is moving to PRO 14 with two conferences of seven teams. "QUOTE The new Pro14 league will kick-off in the first week of September and will comprise two conferences of seven teams. Each conference will have one Scottish side, one South African side, one Italian side and two each from Wales and Ireland.UNQUOTE"
Call me cynical but what are chances of Leinster/Munster/Ospreys and Scarlets being in the same conference? and do the South African teams get into the European Cup if they win the league ? they'll still have to play each other once i imagine, when teams from opposite conferences play. And what happens to all the Scottish/Welsh/Irish derbies? I bet Edinburgh will miss the 20k + crowd they would have had over Christmas. If I was a supporter of any team in that league I would be very pi55ed off!! Why not have one league of 14? The frogs seem to manage it ok.
"The new Pro14 league will kick-off in the first week of September and will comprise two conferences of seven teams. Each conference will have one Scottish side, one South African side, one Italian side and two each from Wales and Ireland. The current preference is for two conferences of seven teams playing each other home and away. Within this format, the teams would also play one game against all the sides from the other conference, which would deliver 19 fixtures. Additionally, each club would also play home and away derby fixtures as well, providing a total of 21 league games. However, other formats are also being discussed. The winners of each conference will qualify automatically for the semi-finals, while the teams placed in second and third in each conference will be drawn together in play-offs for the remaining two semi-final places." I don't think our league structure is perfect by any stretch of the imagination but I am sure I am not the only one who is relived we are not involved in this....!? Mike GC point is very relevant. Do the SA sides get the same access to the European Cup and/or Challenge cup? it's still a far less contrived schedule than super rugby was past year or 2. Golden lions have gone all season without playing a kiwi team yet. IMHO this hasn't been thought through well enough and appears to be a rushed decision to get the S.A. into the Pro league format. Seems to be a bit of a mockery that if the winning side is S.A. they won't be in the European Cup competition, how odd. When BREXIT is finalised, will the Welsh, Scottish & NI sides play in European cups? And will that be the end of the 6N? 5.5% (recurring of course) chance I think. After Brexit Mrs Trellis will need a visa, if EU citizens need a visa to visit the UK. There is even a chance she will need a visa specific to the country she arrives in and a separate one for each country she visits. I've had at least four tourist visas this year. Each took about 5 mins to complete inflight and cost nothing. Of course the UK allows EU criminals to enter without any visa or record check. ..or criminals to leave Mrs T. The same as Wales/Scotland/Ireland do with England. All parties enjoy freedom of movement. Historically enough of ours have moved to Spain to hide from the met. Difficult to decide which is the biggest dog's dinner. The PRO 14 regular season or Brexit? EU criminals commit many crimes here in the UK. UK criminals flee to Spain and commit crimes not in Spain but back here in the UK. Visas aren't a problem and never have been. If EU countries who rely on tourism attempt to enforce visas on British tourists then they will lose out financially. That's why Turkey is desparate to remove mutually imposed visas. visas aren't a problem BECAUSE we are still in the EU. Time will tell if that changes: If we impose visas on europeans it is 100% certain they will impose visas on us. No visas is a product of open borders and free trade (in labour). IN THE UK WE SIMPLY DON'T HAVE ENOUGH PEOPLE OF WORKING AGE (WHO ARE WILLING TO WORK) IN ORDER TO PAY FOR THE PENSIONS AND SERVICES FOR THE EXCESSIVELY LARGE SECTOR OF PEOPLE OF PENSIONABLE AGE. ITS A HUGE DEMOGRAPHIC PROBLEM ONLY PREVENTED FROM WORSENING BY NET IMMIGRATION OF WORKERS AND AN EVER INCREASING RETIREMENT AGE. Apologies for the bold but people keep forgetting. You may well be right but where do you get the figures from to back that up, and should you not have added 'willing to work for a low wage'? The new conferences are based on last season's championship (table?) standings, which were, I think, Munster, Leinster, Scarlets, Ospreys, Ulster, Glasgow, Blues, Connacht, Edinburgh, Benetton Treviso, Dragons, Zebre. So, I thought that maybe they went 1, 3, 5, 7, 9, 11 and 2, 4, 6, 8, 10, 12. But that doesn't compute. So why are Munster, Leinster, Scarlets and Ospreys not in same conference? Or Treviso and Zebre? And why are the two saffa clubs kept apart? They also say conferences will change based on standings? So potentially we should end up with a conference of 'good teams' and a conference of 'not so good teams'. They've divided each conference geographically so each gets 2 Irish, 2 Welsh and 1 each from Scotland, Italy and South Africa. Teams were then ranked according to their standings against the other teams from their Union and placed accordingly. So Conference A got Ireland 1 and Ireland 4, whilst Conference B got Ireland 2 and Ireland 3. This was balanced against Wales 1 and Wales 4 going into Conference B and Wales 2 and Wales 3 into Conference A. Conference A then took Scotland 1, Italy 2 and South Africa 1. It's about striking a balance, if it gets lopsided then it loses all integrity. It looks about right to me. The Super 15/18/??? is an unfathomable mess, other than watching individual matches in a standalone context it's hard to be bothered with it all. Does anyone know who are the additional derbies with for the non Irish or Welsh teams? I suppose to be derbies then the Scots, Italians and South Africans would have to play each other twice. If you can call the South African game a derby, they are only slightly closer together than Edinburgh and Munster - just over 400 miles apart. Thanks for the link, yes, as far as I can see they will play each other 3 times. Guess the home advantage is random? Seems a bit strange but probably there is no better way to do it. Could mean that if one of those pairs is significantly better than the other there could be some easy points on offer each season, giving a slight advantage to the Irish and Welsh teams. This is the first step to SA in the 6N replacing Italy probably, or perhaps one of the "celtic" fridge countries. 7N too much time taken out of the season. Edited 1 time(s). Last edit at 02/08/2017 17:28 by Mrs Trellis of North Wales. Problem with 7N is one country has a bye week each round. Not very fair, and not as exciting. One of the reasons Italy was brought in in the first place iirc. Italy were brought in (too late) because they'd beaten all the 5N sides except England. Their case was overwhelming. My error, that's why Italy was chosen as the sixth, but again iirc they were looking for a sixth in the first place to balance the comp (also who doesn't like a bit more money?). They may well look at adding Georgia and having two leagues of four.